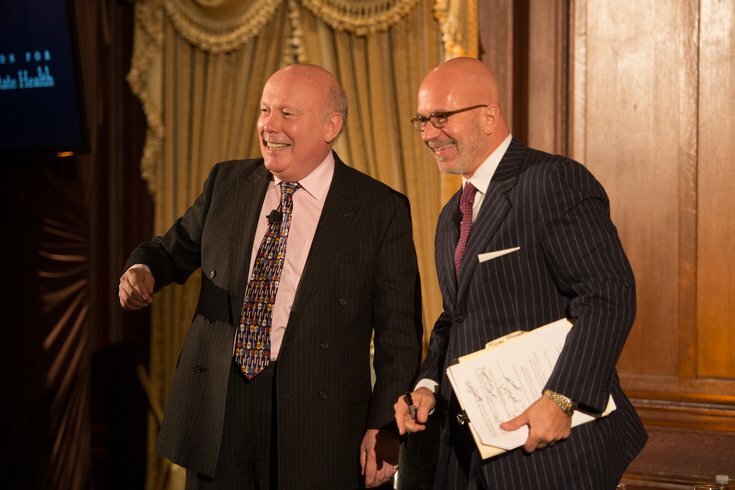 Lord Julian Fellowes and Michael Smerconish on stage at the Union League for "An Evening with Julian Fellowes." 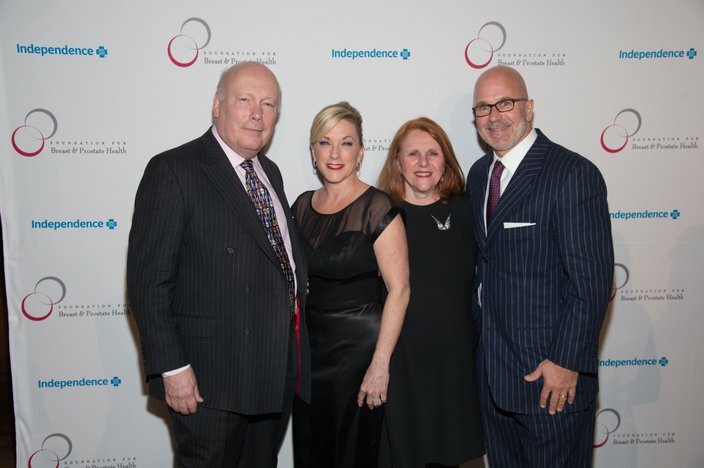 Julian Fellowes, Oscar- and Emmy-winning writer and creator of hit show "Downton Abbey," made a special appearance in Philadelphia Monday for "An Evening with Julian Fellowes" at the Union League. Fellowes sat down with local native Michael Smerconish to discuss the impending final season of the show to benefit the Foundation for Breast and Prostate Health, a Philly-based global nonprofit supporting education and awareness of breast and prostate cancers. Much to the chagrin of the audience, Fellowes could not reveal any secrets from the sixth season of "Downton," though it's already begun airing across the pond. (Of course, that didn't stop Smerconish from asking!) He did, however, provide some insights into his writing techniques, how fans are always asking him to "save" their favorite characters and inspiration for the show's structure. "If this show had been made in the '50s, the family would've been gracious and charming and all the servants would've been funny. If it had been made in the '90s, all the servants would've been trodden down and the family would've been vile. We didn't do either. They're just people," Fellowes said. Fellowes also revealed the moment he realized "Downton" might be a big hit. "We had a very successful screening. You sometimes do that and you have a party after and all the young people come," he said, "and normally, if the show isn't very good, those parties thin out very quickly. And this one went banging on until about 2 in the morning. That was a good sign." Smerconish, true-to-form as a big fan of the show and an award-winning radio host, didn't hold back from asking Fellowes the "tough" questions. He asked why Mary is just so mean to Edith (though, in much plainer language), whether we might ever see the characters go through World War II and if he prefers writers' rooms or writing solo. Fellowes took it all in stride, laughing and joking and entertaining the audience. He even made sure to bring everyone's attention to a Mr. Bates lookalike in attendance. The man, James Black, looked so much like actor Brendan Coyle even the most ardent fans wondered whether it might truly be him. 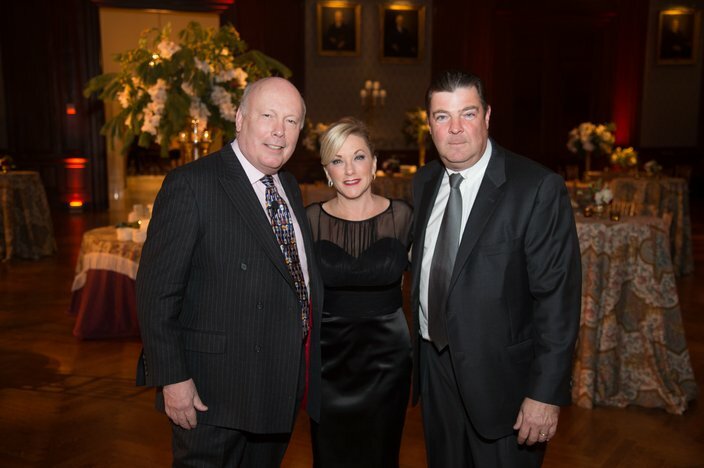 So how did TV royalty like Fellowes come to visit Philadelphia for the night? As it turns out, he and Foundation of Breast and Prostate Health founder Rochelle Schwartz have known each other for more than two decades. Fellowes has been heavily involved in supporting the international organization since its founding and, thus, was able to bring some extra attention to its cause in FBPH's hometown. "We were born in Philadelphia, I'm a Philadelphian, and my husband is a breast cancer surgeon," Schwartz said Monday. "So 25 years ago he came home and said, 'We have an epidemic. It's called breast cancer, and nobody is doing anything.' Twenty-five years ago, nobody was talking about it." Of course, much has changed since FBPH was founded. The organization began as the Breast Health Institute in 1990, and, in the intervening years, breast cancer awareness has soared. In 2004, the Foundation added its Prostate Health International arm that now operates alongside its Breast Health International arm. "When you think today how much awareness there is [for breast cancer], it's in every magazine, every newspaper," Schwartz said. "That's what we want to do with prostate. As many men die of prostate cancer as women do of breast a year." Thus, events that attract a lot of attention to their cause, like bringing in an international celebrity like Fellowes, are important for raising both funds and awareness. One of their most popular events, The Gary Papa Run, returns once again this Father's Day, June 19. Next fall, the Foundation will host a consensus conference for world-renowned doctors in Philadelphia to improve diagnosis and treatment guidelines for prostate cancer. The conference is still in the planning stages, but it is one of the proven strategies the Foundation has used to raise breast cancer education and awareness.